Who says you can’t go home again? After leaving Greg Jackson’s famed academy to join the Blackzilians following a first round submission loss to Joe Lauzon at UFC 136, Melvin Guillard (pictured) has decided to return to Jackson’s in hopes of resurrecting his once promising career. “Im no longer a blackzillian I went back to where I belong Jackson’s:-):-):-):-):-)” Guillard tweeted Sunday evening. Despite following Jackson’s lead towards the top of the UFC’s steep lightweight totem pole, which included five straight wins and a near title shot, Guillard chose to take his talents to Boca Raton, Florida after losing to Lauzon in October 2011. Unfortunately for the 29-year-old, he went just 1-3 under the Blackzilians’ watch. 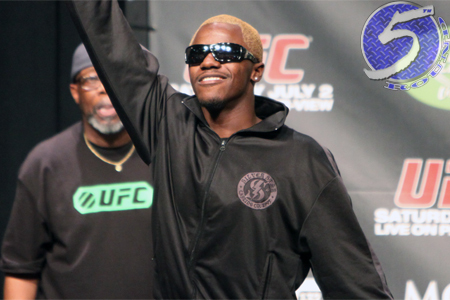 Guillard makes this change at a crucial stage in his career. The 155-pounder has dropped two straight scraps and could be headed for the unemployment line should he run the reverse trifecta. “The Young Assassin” doesn’t currently have a fight scheduled on his agenda. Guillard owns an extensive 30-12-2 (1 NC) professional record. He has lost eight of his 19 bouts inside the Octagon.